At Beutler, we offer round-the-clock emergency plumbing repairs in Sacramento and our technicians are equipped to handle most jobs that come their way. Many repairs, no matter how large or small, require immediate attention. Faucet leaks may seem small but can waste up to 300 gallons per year. A leak in your home’s irrigation system can leak up to 6,300 gallons per month. Our experienced plumbers are equipped to handle most issues that come their way, and will work quickly and efficiently so that your plumbing systems are up and working again as soon as possible. We recommend calling Beutler Plumbing as soon as you suspect an issue. 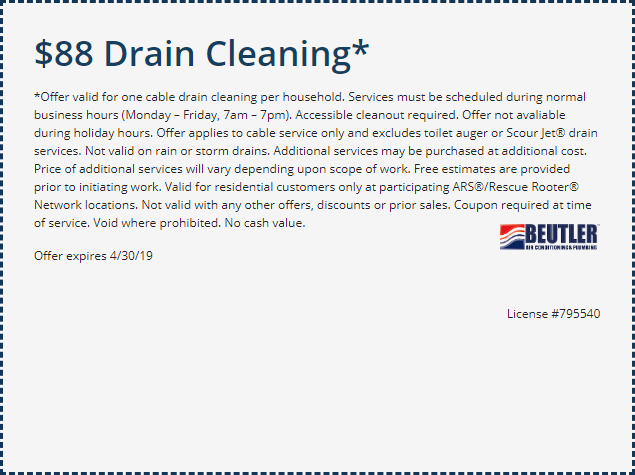 And don’t forget to check out our $50 off plumbing repair coupon. Click the coupon, print it out, and give us a call to save money now! Increasing the size, and plumbing, of your home, kitchen, or bathroom can be a fun and exciting project when you are working with the right team. Replacing your old, inefficient toilet with a new, efficient model can save up to 13,000 gallons of water per year. We are very accustomed to home plumbing installations and installing new pipes, toilets, and other plumbing fixtures to accommodate new room additions and bathroom remodels. We can help you determine the water demand for that room, and best design for optimal plumbing.